In the next several weeks, we will be focusing heavily on reading comprehension and writing skills. Students will be required and expected to do quite a bit of reading at home in preparation for classroom lessons. Please encourage your students and give them time to read what they need so they are prepared for class. The text we will be using is challenging and requires students to work hard and do their best in order to expand their reading skills. We want them to be ready and equipped for rigorous high school curriculum, so help me to encourage them to reach for excellence over the next several months as we know they can! You receive a penny on January 1st, two cents the next day, four cents the next and so on, doubling every day. How long will it take to be millionaire? Suppose you started with a nickel and doubled, how long before you are worth a million dollars? · January 21: No School; MLK Day! PBIS is ready to go! Smokey Mountain Elementary School will host its annual health fair on Thursday, January 10th from 5:00 p.m. to 7:00 p.m. The event, which kicks off with a free healthy meal and will feature over 25 booths covering a wide range of health-related topics including nutrition, mental health, disease prevention, physical fitness, dental hygiene, massage, fire safety and more. Guests will have several opportunities to taste test a variety of healthy recipes and gather up information, and collect free health giveaways. The first 100 attendees will receive free Subway coupons, and door prizes will be given out throughout the night. Kids and families alike enjoy the pirate theme and are welcome to dress up like a pirate, and be part of our "Healthy Crew". Students , Families and members of the community are all invited to attend this special event. For more information about the Health Fair, please contact Smokey Mountain Elementary School at (828) 497-5535. 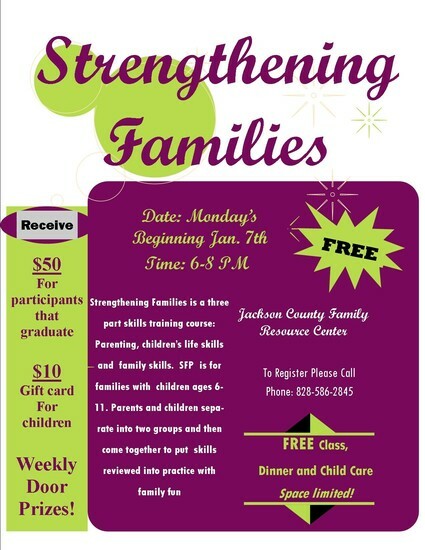 Check out the flyer below for information for the Strengthening Families program. This program will be starting on January 7th in Jackson County.